On my way home yesterday I saw a sign reading “Moving Sale”. Because it’s winter where I live the sale was being held inside the person’s house. That’s always uncomfortable. At least at a garage sale you can walk up the driveway, look at a few things and then pretend to get an urgent text in order to extract yourself from the sea of overpriced Danielle Steel hardcovers and chipped Corelle dinnerware. No hurt feelings, no awkwardness. When it’s being held inside the house there’s the removal of shoes, gloves and hats. You get a glimpse into their life. You see their children’s artwork hanging on the fridge, you smell what they had for dinner. You see that they have the same Costco kitchen table as you but theirs is holding up better. When you walk into that house you are entering into a weird and binding social contract. Names and pleasantries are exchanged. Now, when you find out they’re asking $35 for a 1990s Barbie with a missing hand and a Sharpied-on Hitler mustache, it becomes very awkward to adopt a condescending tone to say, “I don’t think so!” and storm off. Now you have to stop at the front door, tie your shoes (crap, the lace is frayed and came out of the eyelet–doink, doink, doink–this is taking forever) before you can finally make your retreat. Against my better judgement I went to such a sale in my neighbourhood yesterday afternoon and, well, score. Maybe. There on the floor next to the Thighmaster and one of those foot spas that everyone gets for Christmas and then never uses, was a well-worn box of approximately 150 45-rpm records. My heart started racing. Game show bells started ringing in my head. Does she know anything about music? Will it all be crappy country music from the 80s? I see picture sleeves. I offered her $10. She immediately accepted. Crap. I should have said $5. Attempting to sweeten my score I asked her if she’d throw in that ratty copy of Jim Croce’s Greatest Hits and a Moby Grape LP that were both in horrendous condition. Yes. I left without tying my shoes or zipping my jacket. It was all I could do this morning to stay in bed past 5:30am. All I could think about was that tattered box of 45s I left on the kitchen table last night. Even harder to do was sit down and write this post before taking a look. What’s in there? I guess I’ll find out in just a few minutes now. But let me just say this. Even if it turns out they’re totally worthless or scratched and scarred beyond playability, it was $10 well spent just for the anticipation. For anyone that has forgotten what Christmas Eve felt like when you were 7-years old, buy a box of records at a flea market or garage sale and then don’t look at them until the following morning. Exhilarating at the very least. I love notebooks and notepads. I have Moleskines (some real, many fakes) in every vehicle and jacket pocket. My mother-in-law staples sheets of scrap paper together at the top and keeps them by her phone. I love that too. To me a notebook is a place where that novel I’ve been meaning to write will finally take shape. It’s a place where those song lyrics (She had hair the colour of ketchup chips and a Celtic knot from hip to hip…) that bounce around in my head will become more than just an idea, they’ll be real song lyrics because they’ve been committed to paper. When you buy a notebook and stick it in your pocket or purse you’re sending a signal to your brain that says, “I’m a writer now–let’s get to work–I’m open to ideas.” It’s sort of like buying yoga pants because, well, everyone knows you can’t become a yoga enthusiast without the pants. Actually, that’s a horrible analogy because if everyone in yoga pants was actually doing yoga there would be no one at this Walmart. Anyway, Santa slipped this one into my Christmas stocking this year. 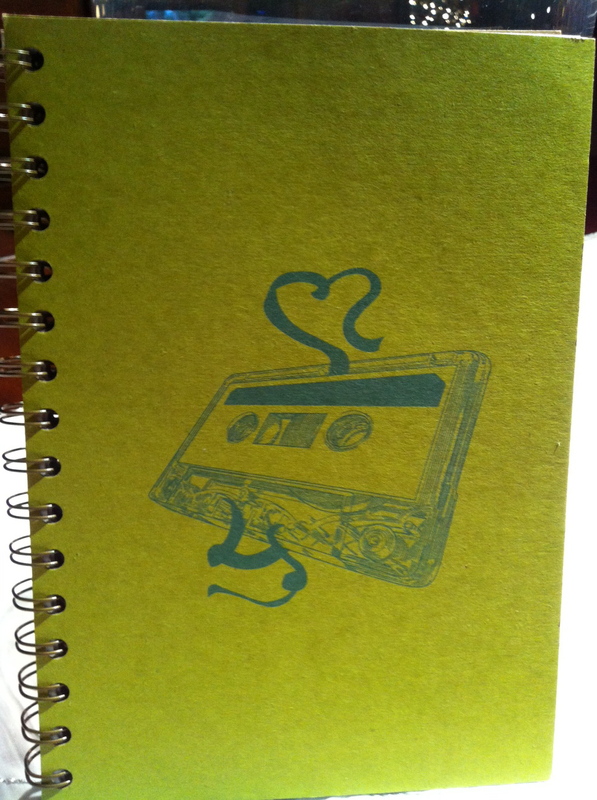 I’m going to fill it with song lyrics and thoughts on music. My first musical thought of 2012: Can a guy my age wear Dr. Dre Studio Beats without looking like a complete douche bag? (I got those for Christmas too.) Discuss.